about in the first place? Have you ever wondered how they were first realised from conception to the super-sonic aircraft we see in our skies today. As with all inventions, including computers there was a starting point. From these building blocks foundation upon foundation is built to develop more powerful and efficient machines of today and onwards into our future. 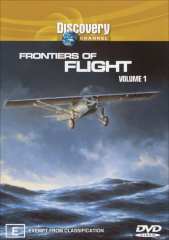 This is what the Discovery channel series Frontiers of flight is all about. In the first chapter "Powered flight" the audience is shown the first man to fly was not the Wright brothers but a German who first proved that manned flight was possible with a kind of glider. Orville and Wilbur Wright built on these early ideas and designed their own glider. The burgeoning genius of these two men was astounding and they learned very quickly from an early age how to use their minds to engineer flying machines that would, in future, push the human race forward. After proving this design was almost infallible they took the very big step forwards, and using the brothers experience with bicycles, they built mans first aeroplane engine. After many attempts at flying and many adjustments to the design the Wright brothers were successful at pioneering the first powered flying machine. The second chapter "Coast to Coast" shows the attempts of Cal Rogers, Oakley Kelley and John McReady to cross America by air. A successful journey by anyone was to be awarded a sum of $50,000 in prize money for their efforts. The legacy of these men is bewildering to say the very least. The early planes did not have a fuselage, had minimum safety precautions which meant if anything went wrong it would spell death to all those on board. The pilots of these aircraft did have parachutes but there was still the danger that the plane could catch fire and incinerate the poor pilot dude. flight from coast to coast in America. At the start of the journey a voltage regulator had to be fixed while the Co-pilot had to fly the plane from inside the fuselage with no forward view to navigate! Quickly it was fixed and the T2 completed the journey it was set out to do. The around the world journey was made in the Douglas World Cruiser and took 175 days to complete. This is astounding and must have been quite a feat without a fold out GameBoy mid flight. The forth chapter "USA/ Europe Non-stop" shows the efforts of an (here we go again, god bless America!!) American man making the first non-stop flight from New York to Paris. His name was Charles Lindberg and by Gees did he make it hard for himself I will leave that to you (the audience) to find out for yourself what I mean. This package is a long one and did become a little mundane after the first two hours but is highly recommended to anyone interested in flight or all those interested in history. A lot of this series involves panning static pictures across the screen with dialogue accompanying it but there is also plenty of motion picture used as well. The static parts you may find a bit tedious and for me I was very close to fast forwarding some bits. The people that are interviewed are as you would expect of an older generation which is a shame as it needed to include some younger participants interviewed on the program make it pack more of a punch. It would have helped to suit a wider audience as surely this is a subject that people of all ages are interested in. Having Gramps most of the time makes us younger viewers feel very young which, I suppose when considered in that perspective, is a good thing. The music is mostly classical, which in ways suits the retrospective approach set out to be achieved by the makers of this DVD. Another annoying aspect of this package was that while it showed Charles Lindbergh standing at speech ceremonies about to conduct a speech it does not show the speech he made. You may find yourself waiting expectedly for this to happen but regrettably only get to hear the voice-over man followed by a change of scene. This is only a minor quibble of an outstanding package. All things considered this is a great educational and interesting documentary.